President Obama’s containment strategy against the Islamic State has failed to prevent the terrorist group from launching further attacks, destabilizing the Middle East and potentially posing a threat to the U.S. homeland, critics say. In an interview with ABC on Thursday, Obama said that the Islamic State (also known as ISIS or ISIL) is not "gaining strength." "From the start our goal has been first to contain and we have contained them," he said. "They have not gained ground in Iraq and in Syria they'll come in, they'll leave." "But you don't see this systemic march by ISIL across the terrain," he continued. "What we have not yet been able to do is to completely decapitate their command and control structures." 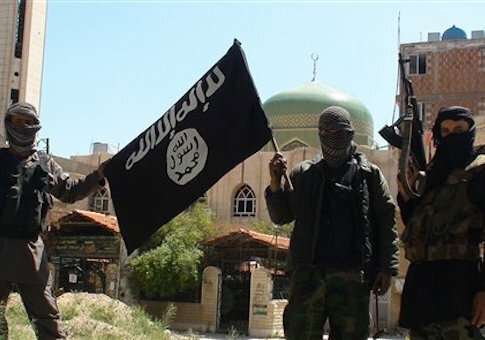 However, analysts increasingly say that while the Islamic State has not dramatically expanded the amount of territory it controls in recent weeks, it continues to conduct devastating attacks and attract followers across the region. The group is the suspected culprit behind the takedown of a Russian plane last month and the suicide bombings in Lebanon on Thursday, both of which killed dozens of people, and now has affiliates in Afghanistan, Libya, and the Sinai. Ryan Crocker, a former U.S. ambassador to Afghanistan, Iraq, and several other Middle Eastern countries during multiple presidential administrations, noted on Friday that Obama originally said he wanted to "degrade and defeat" the Islamic State. "It looks to me that rather than a strategy of degrade and defeat, we are pursuing a strategy of containment," Crocker told MSNBC’s Andrea Mitchell. "I think that's highly dangerous." "The Islamic State is aiming at the disintegration, the destruction of the whole state system in the Middle East," he added. "They may now be aiming at targets outside the Middle East, so I think containment is a perilous course." The destruction of the Russian airliner in particular is "deeply disturbing," Crocker said. All 224 passengers and crew died in the crash, which could mark a turning point for the Islamic State as it begins to target nations beyond the Middle East. "If they are now moving into that phase, we are facing a real strategic threat that goes far beyond the region," Crocker said. "We need to figure out how to counter it. I don't think we have so far." Obama recently announced that he would send up to 50 U.S. special operations personnel into Syria to help train Kurdish and Arab fighters battling the Islamic State. The slight adjustment to U.S. counterterror operations is unlikely to be a "game changer," Crocker said. "We have to decide—[is the Islamic State] a threat to the region and to us?" he said. "If they are, we really need to ramp up our game, not just make incremental changes." "I'm not sure I would want to bet the Empire State building that they're not that great of a threat to the homeland," he added. Despite thousands of U.S. airstrikes in Iraq and Syria that are reported to have killed about 10,000 Islamic State fighters, the group continues to replenish its forces. Intelligence analysts have estimated that almost 30,000 foreign militants from more than 100 countries have entered Iraq and Syria since 2011, with the Islamic State gaining about 1,000 fighters a month, the New York Times reported. More than 250 Americans have entered those countries or attempted to do so. In Iraq, the Islamic State has continued to launch attacks across the country, according to the Institute for the Study of War. "ISIS contested control of the strategic sub-district of Siniya, west of Baiji, and launched explosive attacks against Peshmerga-controlled Dibis district in northwestern Kirkuk, Haditha district in western Anbar, and Sadr City in northeastern Baghdad using explosive attacks," the think tank said in a recent research report. "The attacks demonstrate that clearing operations and the heavy presence of security forces have failed to fully dislodge ISIS in cleared areas or prevent it from launching attacks." Iraqi Kurdish forces, backed by U.S. airstrikes and military advisers, achieved a significant victory on Friday by retaking the northern town of Sinjar from the Islamic State. But the Islamic State has in the past been able to counterattack after defeats, said Michael Rubin, an expert on the Middle East at the American Enterprise Institute, in an email. Obama has failed to respond to the Islamic State’s shifting movements on the ground, Rubin said. "Obama is acting as if it's still early 2014," he said. "Under his watch, the Islamic State has expanded into Libya, the Sinai, and Afghanistan." "I'm writing this from Baghdad where a car bomb killed three dozen today," he added. "Obama's been in office almost seven years. If he doesn't recognize that rhetoric is no substitute for reality, many more people will die." This entry was posted in National Security and tagged Barack Obama, Islamic State. Bookmark the permalink.